↑ "Forsythia suspensa information from NPGS/GRIN". สืบค้นเมื่อ 2008-02-06. 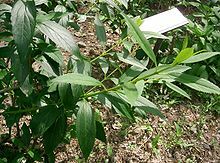 ↑ "Forsythia suspensa - Plants For A Future database report". สืบค้นเมื่อ 2008-02-06. ↑ Davin,, Norman G.; Bedgar,, Diana L.; Katayama and; Lewis (1992). "On the stereoselective synthesis of (+)-pinoresinol in Forsythia suspensa from its achiral precursor, coniferyl alcohol". Phytochemistry. 31 (11): 3869–3874. doi:10.1016/S0031-9422(00)97544-7. PMID 11536515. หน้านี้แก้ไขล่าสุดเมื่อวันที่ 17 พฤศจิกายน 2557 เวลา 21:47 น.